Most phone manufacturers build their own messaging apps with brand specific user interfaces. The Nexus 5 has also removed Messaging and now includes Google Hangouts instead. 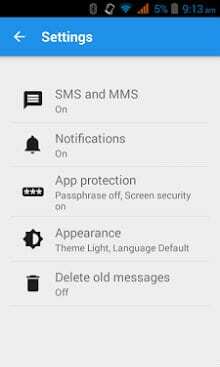 Installing this app allows all Android 4.1+ owners to use the classic SMS/MMS app from Google. Note: If you disable the default messaging app that comes with your phone in System -> Apps no other SMS messaging apps will work. You need to leave the messaging app that came with your phone installed and active for other messaging apps to work or you will experience errors sending and receiving messages.